Christmas decorations are almost all up (The little Christmas tree in my house has been put up since last month!) but I'm all kinds of sad because my finals end only on the 20th (I have exactly 4 days to rush my Christmas presents!)! And we all know that the build-up to Christmas is the BEST part of Christmas (The atmosphere, the hanging anticipation in the air... At least for me. Heh.). 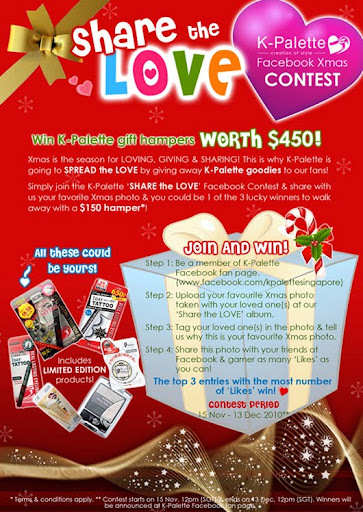 Anyway, K-Palette's celebrating Christmas this year by holding a Facebook contest! It is from the 15th of November to the 13th of December! You stand a chance to win their much raved-about products, like their 24H Real Lasting Eyeliner and the Teka Oil Control Mat Powder (Which holds PR status in my makeup pouch. (: )! 20-something Singaporean who's often lost in the world of numbers and loves nothing more than a good rom-com and copious cups of green tea. UPDATES: School, family and Onsugarettes love! TAG: What's in your 'medicine cabinet'?!? © xoxo, charlene. All rights reserved.